This article explains the Barrett Model, developed by Richard Barrett in a practical way. After reading it, you will understand the basics of this powerful development and motivation tool. What is the Barrett Model? How do we evolve as a people? What is our job and what are we capable of doing? These are pressing questions that many people not only used to ask in the past, but which are still current and relevant today. The development of a person or organisation is something that not everyone easily understands. That’s why Richard Barret developed seven levels of awareness in his model, the Barrett Model. The model is based on Abraham Maslow’s ‘hierarchy of needs‘. Richard Barrett realised that he could simulate the evolution of consciousness with a few small adjustments. The Barrett Model can be applied not only to individuals, but also to structured groups of people such as organisations, societies and nations. 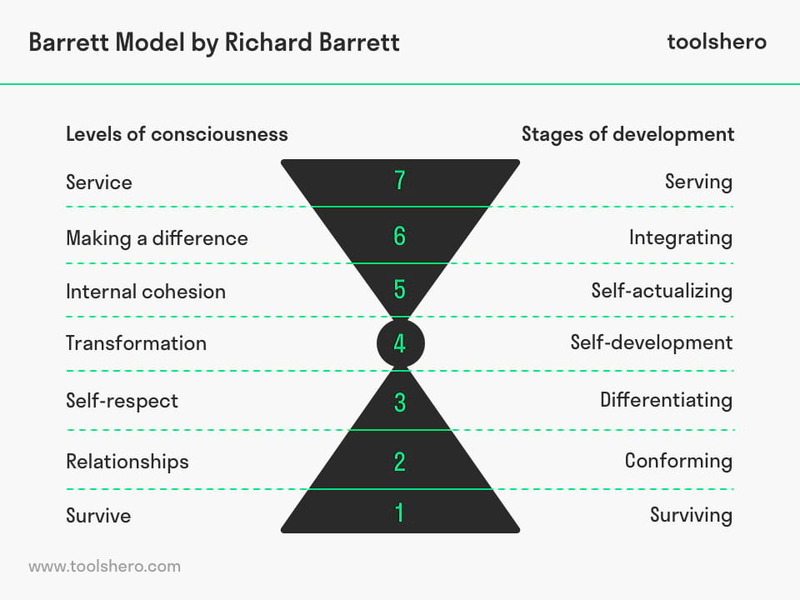 Richard Barrett completed the Barrett model in 1998, after which it was used as the foundation for the ‘Cultural Transformation Tools (CTT)‘. This tool is used to map the cultural values of organisations and their leaders. The Barrett Model consists of two aspects – the seven levels of consciousness and the seven steps in psychological development. Every person operates from one of the levels of consciousness and then grows further in the seven steps of psychological development. How fast a person grows and how far they get depends on their ability to meet their needs. Under normal circumstances, the level of consciousness conforms to the level of psychological development. However, someone may be confronted with a situation that may negatively affect internal stability. A traumatic experience, for example, can cause someone to drop one or more levels on the ladder. Especially when this experience happens to a child or a teenager, there’s the possibility of permanent damage. On the other hand, it can happen that a person temporarily climbs up a few levels on the ladder of consciousness. This happens when a so-called peak experience takes place. Moments of euphoria and harmony belong to peak experiences. Spiritual experiences can also ensure that someone can temporarily shift to a higher level of consciousness. After the peak experience, the person usually falls back to the level of consciousness that corresponds to their level of psychological development. However, it can occur that after exceptional situations, someone continues operating from a higher level of consciousness. When someone has achieved a great result, for example, this can ensure that he or she becomes more confident and moves through a level. All seven levels of self-awareness are discussed below, starting at the bottom of the model. The first three levels of consciousness focus on personal self-interest, a need for love and the desire to belong. Abraham Maslow called these ‘deficiency needs’, or basic needs. Self-esteem is being worked on at these levels. Starting at the fourth level, the person goes through a transformation, and it then becomes about development needs. The focus is then on the general interest of development. Maslow previously called these levels ‘growth needs’. The theme of the first level is survival. This involves satisfying physical and survival needs such as: health, nutrition, financial stability and self-defence. Issues that can counteract the development of the person at the first level are: poverty, violence, greed and corruption. The theme of the second level has to do with social needs. Humans are social creatures by nature. Building up and maintaining harmonious relationships is therefore essential before working on the self-esteem of a person. Relationships include family and friendships. The feeling of wanting to belong somewhere also belongs to this level. It’s necessary to be honest, transparent and to communicate openly. Relationships can be impeded by: hate, jealousy, judgement, conflict and gossip. Self-respect is the last level before the transformation can start. Self-confidence also falls under self-respect. Whenever someone lacks self-confidence, the general interest of development cannot be transferred to the last 3 levels. Self-respect is developed by: independence, pride, discipline and a positive self-image. A lack of self-respect can be caused by: arrogance, status, power and rigidity. On the fourth level, the person or organisation can transition. There is a shift from acting out of your own self-interest to acting out of common interest. During this phase, one learns how to control subconscious fears. This fear causes people to get stuck on the lower levels of consciousness. The focus is on the continuous renewal and development of characteristics such as: courage, team skills, adaptability and knowledge sharing. Starting at this level, there is talk of self-development and the talents that are developed are valorised. The focus of the fifth level is on developing a shared, positive and creative culture with a vision based on values and norms. For organisations, the focus here must be on developing and keeping employees positive. Personal characteristics related to internal cohesion are: integrity, creativity, passion, honesty and trust. A clear vision of the future is created by aligning passions and setting goals. On the penultimate level, it’s all about collaboration, intuition, empathic ability and mentoring. In this phase, the meaning of life or the organisation is determined. The most important thing at this level is the development of relationships based on common interests. At the last level of the Barrett Model, the focus is on service to humanity and the planet. The knowledge and skills that have been built up during the different phases are now shared. Barrett called this level ‘service’ because the heritage that a person with developed talents can leave behind can be used to serve the rest of the world. Obviously, not everyone operates from the same level. If an individual merely focuses on the basic needs, the first three levels, this person may be considered selfish and superficial. A person who focuses exclusively on the top three levels, the growth needs, tends to ignore his basic needs, which can cause unpleasant situations in both personal and social areas. It can also cause incompetence and awkwardness. The most successful people are those who are able to balance their basic and growth needs. They operate from the full spectrum of self-awareness. They trust others and are able to oversee extremely complex matters or situations. They also don’t have any problems quickly adjusting to almost every situation. Until the moment that each person is physically mature, after about 20 years of life, they all follow the same path regarding psychological development. During the first three levels of the Barrett Model, we learn how basic needs can be satisfied. When these needs are not met, a person can become anxious and cannot continue to grow, but when the basic needs are satisfied, attention is no longer paid to them. From about the time someone turns 30, the growth needs are developed; this is where the transformation begins. When these needs are satisfied, the person experiences inner joy and is motivated to share his or her knowledge and gifts with society. What do you think? 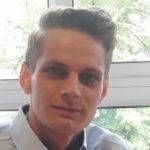 Do you recognise the explanation of the Barrett model? Do you recognise the different levels and phases that you go through? Do you have tips or additions to get more out of yourself? Barrett, R. (1998). The Barrett Model. McLeod, S. (2007). Maslow’s hierarchy of needs. Simply Psychology, 1. R. Barrett Values Centre, eigen website: https://www.valuescentre.com/mapping-values/barrett-model.